NIH Allows Restart Of MERS Research That Had Been Questioned : Shots - Health News The National Institutes of Health has approved requests for waivers from a moratorium on experiments that aim to make the virus that causes Middle East respiratory syndrome more infectious in mice. 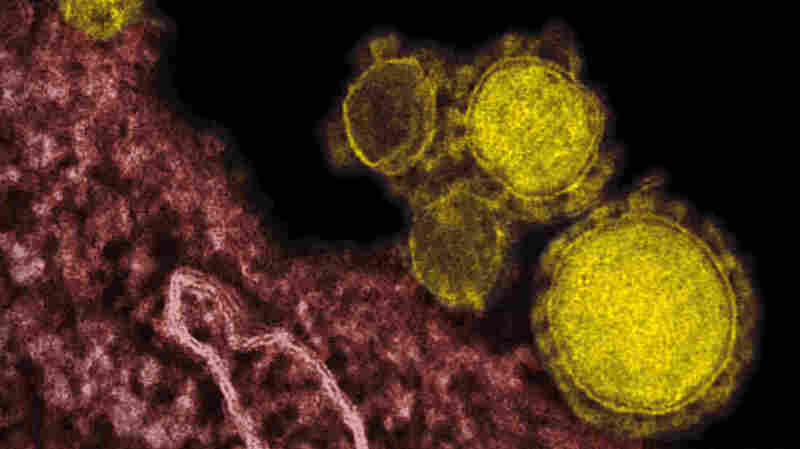 A transmission electron micrograph shows Middle East respiratory syndrome coronavirus particles (colorized yellow). Some researchers who study the virus that causes Middle East respiratory syndrome got an early Christmas present: permission to resume experiments that the federal government abruptly halted in October. The scientists were trying to modify the MERS virus so that it's better able to sicken mice. Their goal is to make a lab model that would let them test vaccines and drugs against this disease. MERS, which seems to normally infect camels, has sickened hundreds of people in the Middle East in recent years. Many have died. Some experts worry that the virus could mutate, start spreading easily in people, and cause a pandemic. They say it's vital to get prepared. But the U. S. government stopped those mouse experiments as part of a temporary moratorium on government-funded research that might make three viruses — influenza, MERS, and SARS (which causes a severe acute respiratory syndrome) — more contagious or deadly. Officials said they wanted to reconsider the risks and benefits of the experiments in the wake of some high profile lab mishaps involving agents like anthrax and smallpox. The review process is expected to take about a year, and includes public meetings like one held at the National Academy of Sciences this week. At the meeting, scientists who study coronaviruses like MERS defended their work. The modifications they're making to the virus aren't likely to make it worse for humans — just worse for mice, they said. That argument convinced Thomas Inglesby of the UPMC Center for Health Security. He's been a prominent critic of past experiments that modified a dangerous bird flu virus in ways that might make it transmissible in people. But since no MERS or SARS scientists are trying to modify these viruses in ways that would make them more contagious in humans, Inglesby says "it seems reasonable and prudent to end the moratorium on coronavirus related work." The day after the meeting, scientists including Matthew Frieman of the University of Maryland School of Medicine got word from the National Institutes of Health that their requests for waivers from the moratorium have been approved and that their mouse experiments with MERS could continue. Other experiments, however, remain off-limits for federal funding. Virologist Ron Fouchier of Erasmus Medical Center in the Netherlands, whose lab did the controversial bird flu experiments with U.S. funding, told NPR in an email that he received stop-work orders from the NIH in October. The point of his research is to understand how bird flu viruses might mutate in ways that would let them sicken people and start spreading like seasonal flu—information that could help public health workers prepare for the threat of a naturally occurring flu pandemic. Fouchier says he didn't apply for a waiver but has asked the government to better define the experiments of concern so that he can continue the non-concerning work. Fouchier questioned whether the government's current effort to weight the benefits and risks of this kind of research is going to provide any new insights that haven't already been discussed over the last three years since the debate over his experiments first began. "I think that the quantitative risk and benefit analysis is going to be close to impossible," Fouchier told NPR. "Whatever the numbers are they come up with, in the end it will still be a judgment call by someone, somewhere." Updated 3:23 p.m.: The National Institutes of Health confirmed the changes in an email. "All studies using a mouse model for MERS (five) have been excepted from the pause," a spokeswoman wrote. "In addition, exceptions were granted for two flu studies. Investigators have been (or will be shortly) informed and an official letter will be sent."